How do you prove who’s the Ultimate Master of Brain Training? With Puzzle Olympics of course! 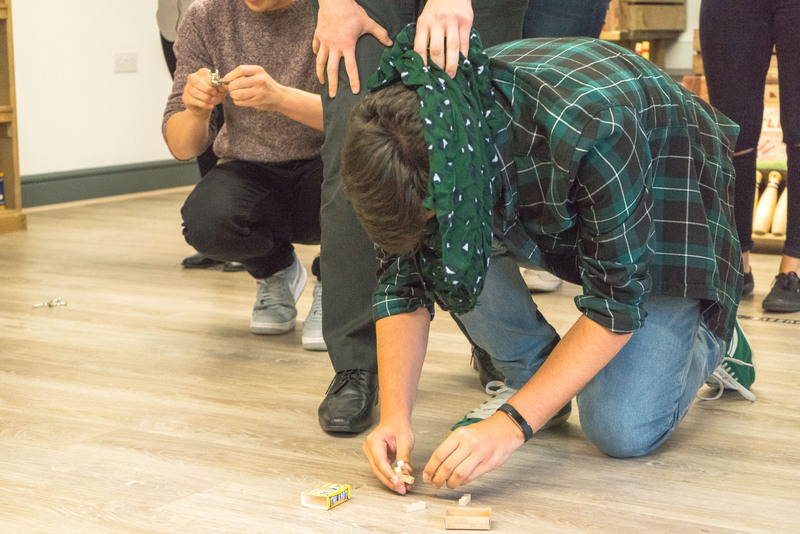 Inspired by Barts Charity’s #1hour campaign to raise money for trauma research and treatment, we decided to let the Professor Puzzle gang put their money where their mouths are and see how well they really know their puzzles! But how to create an obstacle course that would put these puzzlers through their paces? We mixed some metal brainteasers from our Puzzle & Perplex range with our Matchbox Puzzles (they may be small, but they pack a punch! ), our iconic Puzzleman and our colourful tin can alley for a dramatic finish. With the teams set and the blue ribbons patiently awaiting the victors at the finish line, it was time for our top puzzlers to go head-to-head in navigating the puzzles and perils of the merciless Professor Puzzle Obstacle Course! As if the stakes weren’t high enough already, some players decided to level the playing field by bidding to have our best puzzler attempt to solve the puzzles blindfolded! Determined not to let a lack of sight stop his flow, he still managed to ace that part of the relay within the time limit. Congratulations to the very worthy winners – start placing your bets on which team will take the crown at the next Puzzle Olympics!